The history of beer brewing in Louisiana dates back to the region’s occupation as a French colony, with the opening of the La Brasserie New Orleans brewery in 1723. Throughout the next two centuries, notable historic breweries thrived throughout the state, including the New Orleans Brewing Company, which was formed in 1890 as the merger of six high-profile regional breweries. Following the implementation of Prohibition, the state’s beer industry declined, but since the opening of Abita Brewing Company in 1986, it has experienced a revitalization. Today, the state is home to more than three dozen breweries and brewpubs, ranking it 36th in the nation for craft breweries per capita. 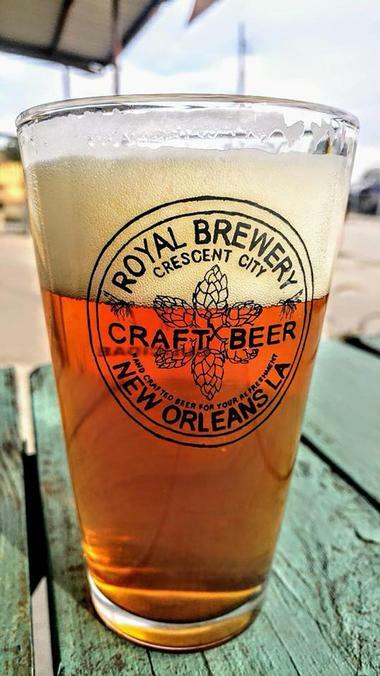 Royal Brewery New Orleans was the vision of artist Raymond Pumilia, who began homebrewing in the mid-1990s. The brewery was opened to the public in the spring of 2017 and is located near New Orleans’ Lakefront Airport and South Shore Harbor. Its signature Culicidae American Pale Ale is tapped at a number of local restaurants and bars throughout the New Orleans area. Other brews include its taproom-exclusive Fruit Fly American Special Bitter Ale, Bug Leight Session Steam Lager, Termite Loger California Common, and Chevelle Diablo Porter. Housemade ginger ale is also tapped at the brewery’s taproom, which is open to the public on Saturdays and Sundays. » Southern Craft Brewing Co.
© Southern Craft Brewing Co.
Southern Craft Brewing Co.’s name is meant to emphasize its uniquely Southern ethic, hospitality, and locally-sourced operations, which utilize ingredients such as authentic Louisiana honey and Carolina malts. It was founded by friends and homebrewers Joe Picou and Wes Hedges, who were inspired to open a microbrewery following their success at the 2011 National Homebrew Competition. Flagship brews offered include the brewery’s Red Stick Rye, Pompous Pelican Smooth-Drinking Double IPA, and Swamp Sting Louisiana Honey Light American Ale, while seasonal brews include the Seasonal Citeaux Coffee Oatmeal Stout, which showcases beans from local Cafeciteaux Coffee. The brewery’s tasting room is open to the public Thursdays through Saturdays, with tours available at select times. The Courtyard Brewery was New Orleans’ first nanobrewery at its 2014 opening, founded by Lindsay Hellwig and Scott Wood. 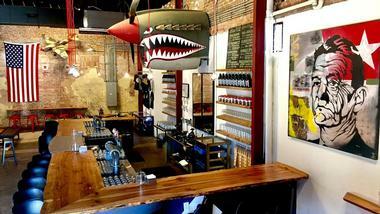 It offers 19 taps at its Erato Street taproom facility, which is open to the public Wednesdays through Saturdays. The brewery’s notable beers include its Blanche de Orleans Witbier, People Power American Wheat, Blithe Spirit Saison, Unorthodox Interpretations Belgian Blonde Ale, and Join the Parade and On A Spaceship Somewhere American IPAs. 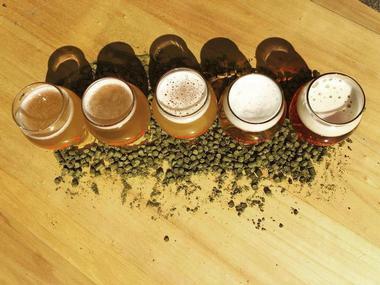 Mixed-fermentation beers are also offered, along with a number of rotating taps from top regional and national craft breweries such as New Belgium, Lagunitas, and Ballast Point Brewing Company. » Brieux Carre Brewing Co.
© Brieux Carre Brewing Co.
Brieux Carré Brewing Co. crafts unique New Orleans beers mirroring the city’s eclectic vibe and laissez-faire spirit. The brewery specializes in creating unique one-off recipes highlighting unusual ingredients, with brews rotated weekly at its seven-day-a-week taproom. It was opened in 2017 by Robert Bostick within the city’s Marigny neighborhood and showcases a full-service location of the Brügger's Barbecue restaurant. Past brews include its Random Book Quote Mango American IPA, Barnyard Circus Folk Saison, Costumes Encouraged New England-style IPA, Notice Me Senpai Robust Porter, and I Am a Donut Berliner Weisse. An annual Brieuxminati Club is available, offering member benefits such as discounted growler fills, exclusive brews, and invitations to the brewery’s annual members-only party. Covington Brewhouse is a brewery located within Covington’s historic downtown district, operated out of the city’s former Alexius Bros. Hardware building. It was originally opened in 2005 by Fritz Schroth under the name Heiner Brau and was Louisiana’s third post-Prohibition-era brewery, following the openings of Abita Brewing Company and Crescent City Brewhouse. Today, it offers a public taproom that hosts community events such as the annual Rockin’ the Rails live music series. Year-round brews include its Bayou Bock, Strawberry Ale, Anonymous IPA, and Pontchartrain Pilsner, while seasonals include a Spring Pale Ale, a Rock and Roll Summer Farmhouse Ale, an Electric Porter, and a specialty Rock Star Series. 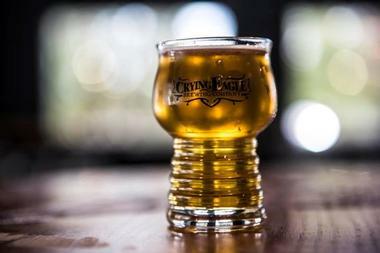 Crying Eagle Brewing Company’s name is a translation of the indigenous Atakapa term Quelqueshue, which was also used in naming the region’s Calcasieu River. The brewery was opened in 2016 by Eric Avery and offers a 1,500-square-foot brewhouse and beer garden that is open to the public Wednesdays through Saturdays, with public tours offered on Friday and Saturday afternoons and evenings. Flagship brews include its Pistol Bridge Porter, Louisiana Lager, Ready to Mingle Belgian-style Single, and Hop Blooded IPA, while specialty beers include a seasonal Strawberry Rye and a Calcasieu Common Ale. Light pub fare is served at the Bistro at Crying Eagle, including pizzas, panini sandwiches, and bar appetizers. 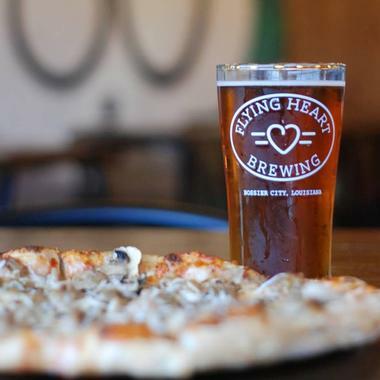 Flying Heart Brewing is a Shreveport brewery located within old downtown Bossier City’s historic Fire Station Number Six building. It was opened in 2015 by couples and friends Ben and Elizabeth Pattillo and Ben and Leah Hart and offers a new pizza kitchen and pub facility, serving unique handcrafted pizzas designed to pair with the brewery’s beers. Year-round flagships include the brewery’s Louisiana Amber Ale, Milk Maid Stout, Firehouse Blonde, Six of Hearts Golden Ale, Black Heart Ale, and Barrel 52 Robust Porter, with seasonal offerings available periodically on draft. Craft cocktails are also served, along with a wide selection of fine wines and liquors. Periodic public special events include live music performances and liquor tasting events. 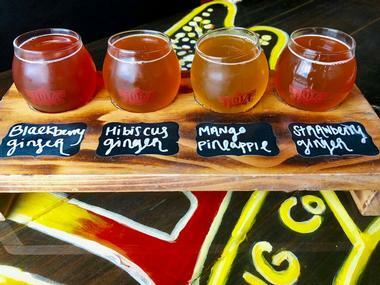 Flying Tiger Brewery was the vision of business partners Robert Brewer, David Johnson, Brooks Hamaker, and James Simpson and is a reference to the famed World War II flying squadron, which has ties to the Monroe region through its former commander, a longtime area resident. Its casual taproom was opened to the public in 2011 and offers weekend tours, live music performances, and rotating food truck pop-ups. An outdoor beer garden is also offered at the facility, which is open Wednesdays through Saturdays. Four year-round flagship beers are brewed, including the Man at Arms Amber Ale, Burma Blonde lager, Heroic Hops IPA, and draft-only Nitrogen Milk Stout. 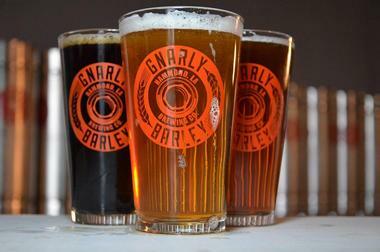 Gnarly Barley Brewing was the vision of homebrewers Zac and Cari Caramonta, who gained their reputation on the Louisiana craft beer scene following their appearance at the 2011 New Orleans on Tap Beer Festival. The 14,000-square-foot brewery, which was opened in 2014, has been named as one of the country’s fastest-growing breweries and was the recipient of the prestigious 2017 Louisiana Lantern Award for excellence in manufacturing. It offers a family-friendly and dog-friendly open-air taproom with views of the brewery’s operations that is open to the public Fridays and Saturdays, with periodic tour times available. Flagship beers include the brewery’s Catahoula Common, Radical Rye-P.A., Korova Milk Porter, and Jucifer New England-style IPA. Great Raft Brewing is a Shreveport brewery that was opened by Andrew and Lindsay Nations in 2013, making it the city’s first modern microbrewery since the Prohibition era. It offers three flagship year-round brews, including its Southern Drawl Pale Lager, its Reasonably Corrupt Black Lager, and its Commotion Pale Ale. Seasonal and small-batch brews include its Make Believer Session IPA, Born In A Barn Belgian Saison, Grace and Grit Double IPA, and several recent collaborations with Washington, D.C.’s Bluejacket Brewery. Its adults-only tasting room offers tours on Saturday afternoons and sells drafts and to-go cans and bottles Wednesdays through Saturdays. New Orleans Lager & Ale (NOLA) Brewing was the vision of Kirk Coco, who was inspired to open a New Orleans microbrewery following 2005’s Hurricane Katrina. Working with former Dixie Brewing Company brewer Peter Caddoo, Coco founded the brewery in 2007 and began selling its flagship NOLA Blonde and NOLA Brown Ales. Today, the brewery operates a taproom on Tchoupitoulas Street that is open to the public seven days a week, offering free brewery tours every Friday. Its serves its signature ales on tap and to go, including its 7th Street Lemon Basil Wheat beer, Revivalists American Pale Ale, Hoppyright Infringement Imperial IPA, and Green Wave Krystallweizen. Food is served by McClure’s barbecue, and public special events include weekly Tap Room Yoga events on Monday evenings. 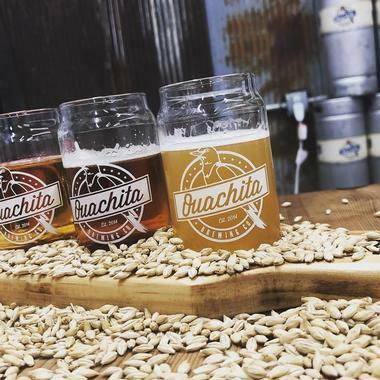 Ouachita Brewing Company was founded by homebrewer Heath Lord, who studied old-world brewing styles throughout Germany, France, and Belgium in the late 2000s before beginning to compete in the region’s homebrewing scene in 2012. At its 2016 opening, the brewery became northeast Louisiana’s first licensed brewery. It brews year-round offerings such as its DeltaPils Bohemian Pilsner, Conflicted Coffee Porter, Petticoat Rebellion Pale Ale, and LouisiAmber American Amber Ale, along with clever seasonal offerings such as its Grab ‘Em By the Trumpkins Pumpkin Pie Cream Ale. Its taproom is open to the public Thursdays through Saturdays and hosts public special events, including events held in conjunction with community partner organizations. Parish Brewing Co. is Louisiana’s second-largest brewery, located in Broussard within the heart of Cajun Country. The brewery was an overnight success for its Canebrake Louisiana Wheat Ale, which remained in significantly higher demand than its production capacity until the 2012 opening of its new brewhouse facility. Today, it also crafts a wide variety of IPAs, including the Bloom and Nova Vert juice bomb IPAs and the Ghost in the Machine Double IPA. Other beers include its Envie American Pale Ale, South Coast Session Amber Ale, and Reve Coffee Stout. A specialty reserve series offers barrel-aged brews, while limited releases focus on dry-hopped ales and imperial variants of the brewery’s flagships. Its kid-friendly and dog-friendly taproom is open to the public Mondays through Saturdays and offers brewery tours throughout the afternoon on Saturdays. 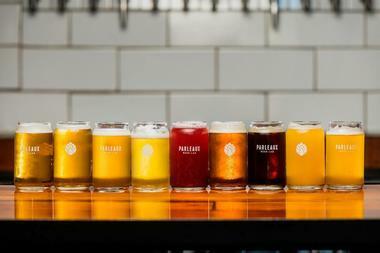 Parleaux Beer Lab is a destination microbrewery and taproom within New Orleans’ Bywater neighborhood, committed to creating high-quality small-batch ales in a variety of iconic brewing styles. The brewery strives to capture its home city’s eclectic creative spirit, crafting constantly rotating seasonal experimental beers. 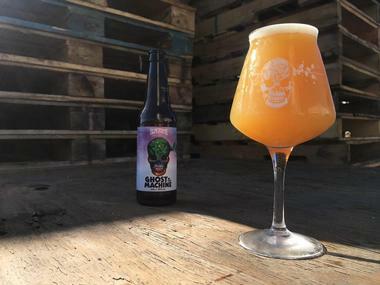 Popular offering sinclude its Foggy Glasses New England-style IPA, The Sun Also Sets West Coast IPA, Strange Charm Sour IPA, and Bass Clef Gulf Coast IPA, along with darker beers such as its Tiramisu Imperial Stout and Philosopher’s Stone Czech Dark Lager. Its family-friendly taproom is open to the public Thursdays through Mondays, with happy hour prices offered on weeknights. Rotating food truck pop-ups are hosted on site, along with brewery tours and a variety of public special events. » Port Orleans Brewing Co.
© Port Orleans Brewing Co. Port Orleans Brewing Co. was opened by former football player Zach Strief and aims to produce high-quality beers that are highly flavorful and drinkable. The brewery’s operations are located below sea level in New Orleans and offer a family-friendly public tasting room facility with a dog-friendly patio. Flagship brews include the brewery’s Riverfront Lager, Storyville IPA, Slack Water Brown Ale, Royaltea Pale Ale, Ella Pilsner, and Sean Payton’s Blonde Ale, brewed in honor of the New Orleans Saints head coach. 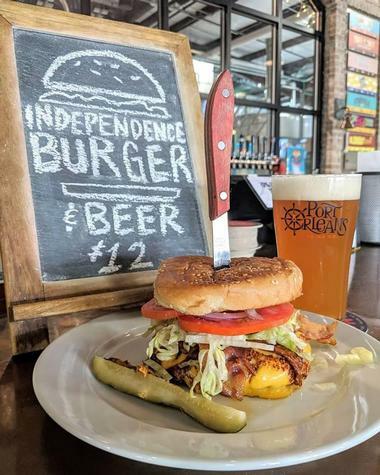 The brewery’s Stokehold Restaurant offers a variety of beer-paired small plates and shareable entrees, including Gulf-inspired favorites such as shrimp toast and crawfish sliders. 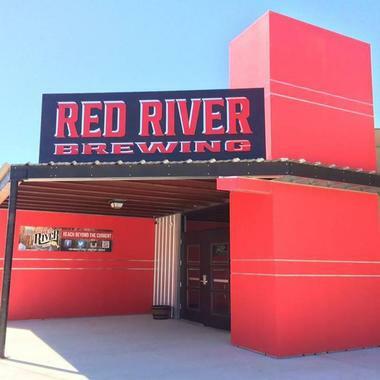 Red River Brewing Company was Shreveport’s first local brewpub since the Prohibition era, established in 2012. The brewery is best known for its flagship Hay Ryed Louisiana Rye Pale Ale, which pays tribute to the region’s rich jazz and blues music history. 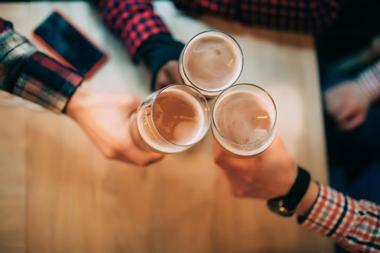 Other notable beers include its Bragg Peak Belgian Strong Pale Ale, Captain’s American Porter, Heliopolis Munich Helles Lager, and Napoleonic Code Berliner Weisse. Since 2017, the brewery has operated the Fat Calf Boucherie, a British-style gastropub with Louisiana flair overseen by executive chef Anthony Felan. Shareable plates and craft sandwiches are highlighted, along with a full children’s menu and wine and spirits list. Taproom events include a Books and Brews book club, taproom trivia nights, and yoga on tap events. Second Line Brewing is located within New Orleans’ Mid-City neighborhood and takes it name from the city’s tradition of second-line parades, which trace back to century-old jazz funeral traditions and are popular local events for a number of special occasions. The brewery is known for its sustainable practices, including its partnership with Local Cooling Farms to reuse spent grains. Year-round brews include its Batture Blonde Ale, Route 47 Red IPA, West Coast IPA, and A Saison Named Desire. 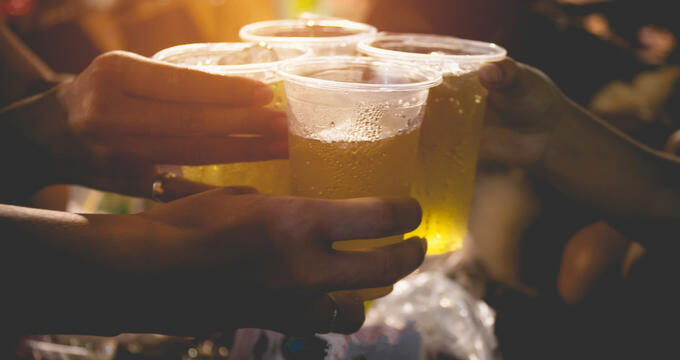 Its family-friendly and pet-friendly beer garden is open to the public seven days a week and serves as a local community gathering spot, hosting a variety of public special events. 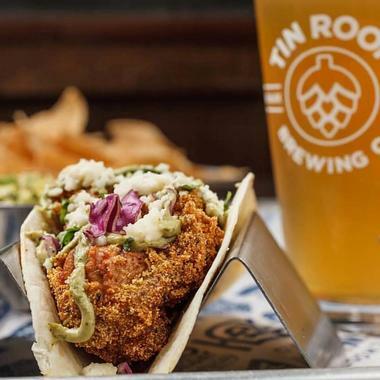 Tin Roof Brewing Co LLC is Baton Rouge’s largest craft brewery, located near Louisiana State University. The brewery was started by two childhood friends in 2010 and offers a taproom facility that is open to the public Tuesdays through Sundays. Flagship beers include its Uber Froot Blackberry Berliner Weisse, Voodoo American Pale Ale, Tin Roof Blonde Ale, and Juke Joint American IPA, while seasonal offerings include its Parade Ground Coffee Porter, Gameday Session IPA, and Bayou Bengal Pale Lager, which is officially licensed for brewing during the university’s football season. Public special events at the brewery include weekly Yoga on Tap events and brewery tours, which are offered on Saturday afternoons. Urban South Brewery was founded by Jacob Landry and strives to blend old-world European styles with new American techniques and a unique New Orleans creative flair. Its kid-friendly taproom is open to the public seven days a week, with public brewery tours offered throughout the weekend. Year-round brews include its Charming Wit, Holy Roller IPA, Paradise Park American Lager, Coop’d Up Farmhouse Ale, and 2nd Set Pilsner, while seasonal styles focus on fruit-forward styles and dry-hopped IPA variants. 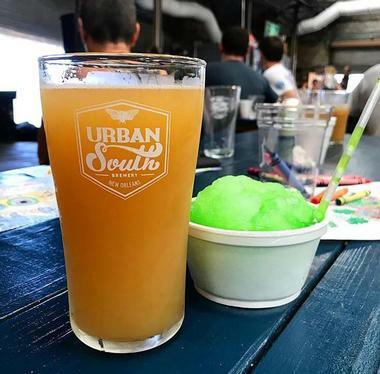 A variety of public special events are offered at the brewery, including rotating food truck pop-ups, trivia events, beer release parties, and sports viewing events. Wayward Owl Brewing Company was founded by Lafayette native Justin Boswell, who returned to the New Orleans region after pursuing a successful brewing career in Seattle. The brewery offers a public tasting room at the historic Gem Theater, which was opened in 1951 as the region’s last segregated African-American theater. In 2011, the building was designated as a city landmark by the New Orleans Historic District Landmarks Commission. The tasting room is open to the public six days a week and serves brews on tap and to go, including the brewery’s flagship Clean Slate IPA, Tawny Twit English Pale Bitter, Scops Scotch Ale, The Grind Brown Ale, and Privateer Pale Ale. Rotating food trucks are offered on site, along with beer snacks provided by the brewery. Visitors may also order in their own delivery from a number of local restaurants or bring their own food to the taproom. Abita Brewing Company was founded in 1986 and has become the state’s top craft brewery today, producing more than 151,000 barrels of small-batch beer annually at its Covington brewhouse. 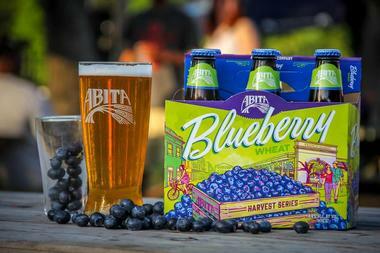 All preservative-free brews are crafted with pure artesian water from nearby Abita Springs, with many emphasizing unique fruit flavors. The brewery has become nationally renowned for year-round brews such as its Purple Haze Raspberry Lager, Big Easy IPA, and Strawgator Strawberry Harvest Lager. Limited-edition and seasonal beers include its Christmas Ale, Creole Cream Ale, and Mardi Gras Bock, while craft non-alcoholic sodas include its Pecan Pie Soda, Vanilla Cream Soda, and Abita Root Beer. Its visitor center and taproom offers guided tours seven days a week, while its full-service Abita Brewpub serves a variety of unique American fare. Bayou Teche Brewing was founded in 2009 by brothers Byron, Dorsey, and Karlos Knott and is influenced by Karlos’ experiences serving a six-year deployment in West Germany. Following his return, Knott wished to create a microbrewery that would create old-world-style beers specifically designed to pair with classic Cajun dishes. When it opened, the brewery was housed within a converted railway car, but today it has been developed into a full farmhouse brewery facility, featuring a taproom open seven days a week. 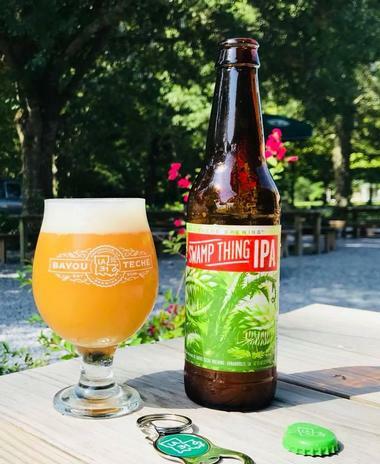 Innovative brews include the brewery’s La 31 series, which showcases beers such as its Acadia Farmhouse Ale, Swamp Thing IPA, Cocodrie Double Dry-Hopped IPA, and Walking Dead Coffee Kolsch. Brewery tours are offered on Saturday afternoons, and Cajun jam sessions are hosted every Sunday. Southern Craft Brewing Co., Photo: Southern Craft Brewing Co.
Brieux Carre Brewing Co., Photo: Brieux Carre Brewing Co.
Parish Brewing Co., Photo: Parish Brewing Co. Port Orleans Brewing Co., Photo: Port Orleans Brewing Co.